Tweaking your landing pages can dramatically improve your conversion rates. Sometimes, even the smallest changes can make a massive difference. In this post, we are going to look at some tips and tricks to get the best out of your landing pages and skyrocket your conversions. Tim Ashe is an expert in landing page optimization. I was at Content Marketing World recently and he did a presentation with no slides. He just asked the audience to email him their landing page and he ripped them apart on screen. They were brave to put themselves at his mercy like that! But his advice was well worth it. You know from Google Analytics and other online tools that you can find out a lot about your site visitors when they arrive on your website. On Neil Patel’s website (here), he takes advantage of this by analyzing the IP address of the visitor and then mentioning their location. This makes Neil’s landing page stand out to his audience. Visitors will do a double take, and anything that grabs attention like this can have a really positive effect on conversions. 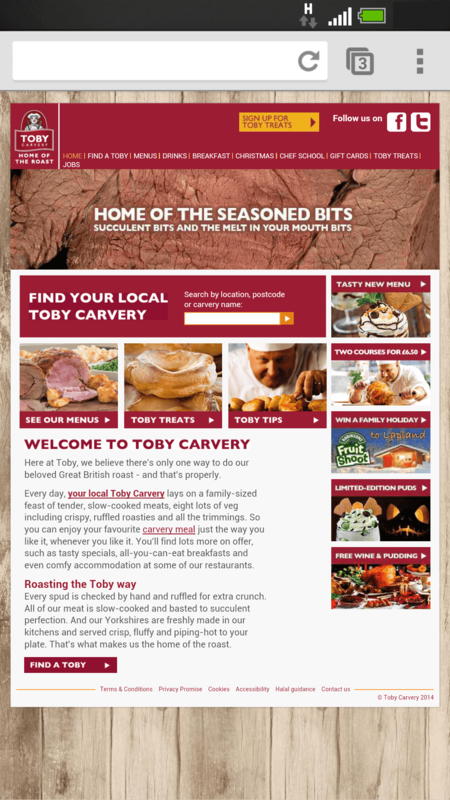 Think about what other types of personalisation you could take advantage of on your landing page. This could include things like using the IP address to detect geo location and then making sure your site displays the correct currency, a phone number that’s local to the visitor, etc. Another approach is to use information about where the visitor came from to personalize a landing page. So, if they clicked on a particular advertisement, you know that they are looking for something specific. You can set up your landing page to mention the keywords your visitor searched for, to make it as relevant as possible to each unique visitor. When a prospect lands on your website, you need to really focus their attention on what you have to offer them. It can be tempting to add as much information as you can think of to try to persuade people to enter your marketing funnel, but the result is just confusing! If your visitor can’t decide which link to click or which of your videos to watch, you are likely to lose them. Less is more! Even having your usual navigation bar, with links to the rest of your website, can distract your visitors from doing whatever it is you want them to do, whether that is to subscribe to your email list, buy your product or sign up to a webinar. Going for a simpler, less cluttered approach focuses attention on your product, service or offer. Apple are famous for their minimal advertising campaigns, where customers’ attention is directed to the product they are selling, and nothing else. VideoFruit‘s landing page also has no distractions. Above the fold, it has just a headline and an email sign-up box. There are no menus or links until you scroll down to the very end. They make it very easy for customers who arrive at their website to sign up and get the information they need. For our blogging course, we set up a timer on our landing page. When the time runs out, the landing page disappears and switches to an expiry page. This is an effective way of giving people a nudge to make a purchase, if they are wavering. Creating a sense of urgency is a well-known psychological technique in a salesperson’s ‘persuasion’ toolbox. When people feel like they might lose out on something special, they are more inclined to go for it! This is why you will often see phrases like, “Don’t miss out!”, “Get it while you can!”, and “Only available for 24 hours!” on sales pages. 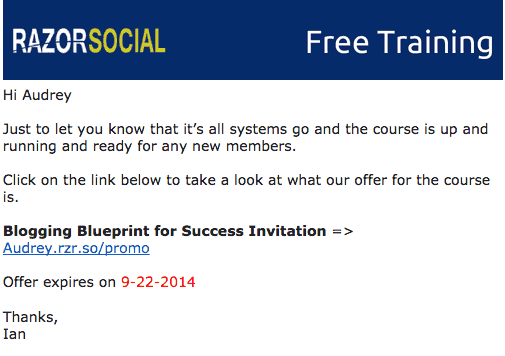 Here is an email we send out for our blogging course, which has a link to the timed landing page. People are more inclined to take action if there is a time limit. We use Ontraport, which controls access to the page to make sure that people get the offer for the correct amount of time. Brian Deane from Backlinko wrote an epic blog post on the Smart Passive Income website, with really detailed information on backlinking strategies. At the end of the post, in his author bio, he links to a page with a free download that is specific to the SPI community. This makes it a highly targeted freebie, which means readers will be much more likely to sign up to his mailing list to get their hands on it. 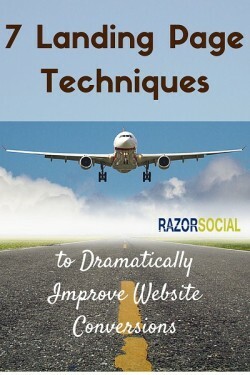 Are you creating landing pages specific to websites you are guest posting on? landing pages specific to advertisements you create? Invest in landing page software, see next point! Choosing the right landing page design is vital if you want to maximize your conversion rates, and landing page templates make this a lot easier. You don’t need to understand coding or get a web designer to do it from scratch, you just choose the design you want and fill in your information. We use LeadPages for our landing page templates, which analyzes the results of their customers and allows you to sort pages by highest conversion rates. With LeadPages we add a plugin to WordPress so can quickly publish pages. 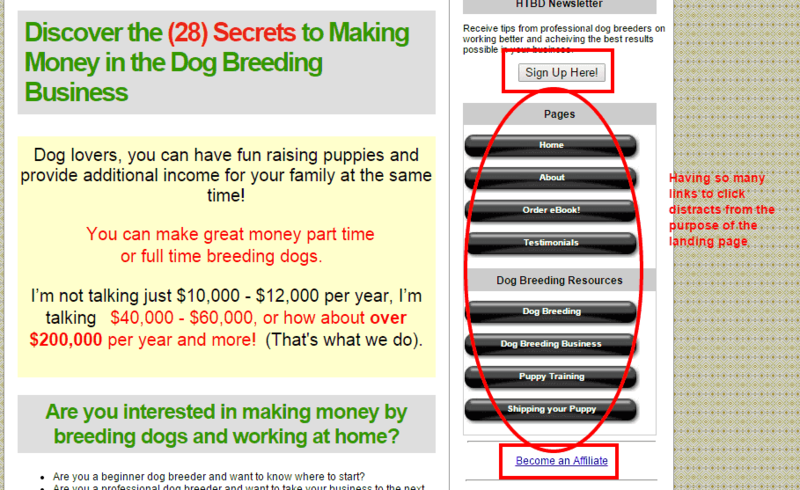 Firstly, you choose the kind of landing page you are looking for, from the options on the left. Then, you can select ‘sort by conversion rate’ and LeadPages will show you the options, in order of success. Different templates have different features, so you can choose a design that incorporates exactly what you are looking for. No matter how much you know about landing pages, you can still benefit from testing your pages to see which converts the best. Sometimes, even the tiniest change can make a difference, and you never fully predict how customers will react to different colors, copy or designs. Split testing can be done in two ways: A/B testing or multivariate testing. The one you should choose will depend on your business and the number of visitors your site gets. A/B testing tests two variations, side by side, so that you can test different aspects of a landing page and choose the one that gets the highest number of conversions. Multivariate testing is more complex and tests a lot of variations at the same time. Even if a change to a landing page only shows a small conversion increase, it is still worth making the change. This is because you can then test another variation, then another, and the small increases in conversions will add up over time until they show a significant boost. LeadPages allows us to carry out landing page testing, so we can find out the highest converting headlines, testimonials, calls to action, templates, offers etc. Any business that ignores mobile internet users is throwing away the chance of gaining many new customers or clients. 58% of Americans accessed the internet on mobile devices last year (Statista), and this is expected to increase to 80% in 2017. Smartphone and tablet users make up 1/3 of Google and Facebook ad conversions (Econsultancy), so failing to prepare for mobile visitors to your site is a real conversion killer. When a website is not compatible with mobile devices, users quickly go elsewhere. If they see tiny text, links that they can’t click, or a full-size website squished to a few inches in size, they abandon them. Making sure your landing page is compatible with mobile devices is absolutely essential for any business. Whether you go for a separate mobile site or a responsively designed site, be sure that mobile phone and tablet users can get the best of what you have to offer. Developing your product or service and building your website is only the start of the process of building up your customer list and getting conversions. Your landing page can make or break your offer or your deal, so pay attention to what you are doing, and optimize it for conversion success. Do you have any favorite landing page tips? Which of the above are you going to apply to your website?